Either party, or both parties can request that the Court issue an alimony order as part of the terms of the Judgment of Divorce. Alimony is defined as support payments from a spouse who has an ability to pay to a spouse who is in need of support. This is the second part in a three (3) part series on alimony. In our blog, we discuss how the Court calculates the amount of alimony when the Court enters an alimony order. Once the Judge has decided to enter an alimony order, the next item for the Judge to decide is the amount and duration of the alimony order. The Alimony Reform Act of 2011has provided statutory guidance to Judges on how to calculate the amount of alimony. The amount of alimony is generally calculated between thirty to thirty-five percent (30%-35) of the difference in the parties’ respective gross incomes. Gross income for purposes of alimony excludes capital gains income and dividend and interest income which come from assets divided as part of the divorce and income which was used to calculate child support. The amount of alimony is further determined by the payor’s ability to pay and the receipient’s need. In Young v. Young, 478 Mass. 1 (2017), the court elaborated on the term “recipient’s need” and provided that the recipient’s need is based upon the lifestyle the parties enjoyed during the marriage and not the lifestyle the parties would have enjoyed if the marriage had not been terminated. As such, when the Judge is calculating the amount of alimony, it is important for the Judge to avoid entering an alimony order which exceeds the amount the recipient spouse needs to maintain the lifestyle the recipient spouse enjoyed during the marriage. However, as is commonly the case in a divorce, the household income that was enough to provide for one household might not be enough to provide for two households. The Court must find a fair balance when entering an alimony amount so that both spouses will be able to maintain their respective households. Another consideration for the Court when determining the amount of alimony is the tax treatment of the alimony order. As of January 1, 2019, all new alimony orders will no longer be treated as taxable income to the recipient and tax deductible to the payor. This means that the recipient in an alimony order entered after January 1, 2019 will not have pay taxes on support received and the payor in the alimony order entered after January 1, 2019 will have to pay taxes on support paid. It remains unseen how much weight the Court will give to the impact the Tax Cuts and Jobs Act of 2017when entering new alimony orders after January 1, 2019. 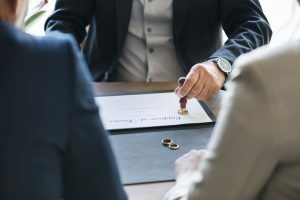 One can speculate that the amount a recipient receives in alimony after January 1, 2019 will be less given that it will be excluded as taxable income to the recipient. What is certain is that the Court will consider the tax implications when entering alimony orders. For a further discussion on the Tax Cuts and Jobs Act of 2017 and its effects on alimony, please check out our blog titled, The Effect the Tax Cuts and Job Act of 2017 has on Alimony. The amount of alimony the Court enters depends on the specific facts and circumstances of the case.For exceptional assistance regarding any aspect of your divorce case, contact the knowledgeable and experienced attorneys at Karpenski & Schmelkin, Divorce and Family Law Attorneys for more information.